Balance Point: T/7i, The Perfect Blend T/7i is, without reservation, one of the most-balanced RELs of all time. In order to achieve perfect balance, a sub must weigh speed against heft, while ensuring true extension-depth-and do so in a physically harmonious package. T/7i manages to make it all seem easy. Quick and delicate for a perfect blend, it can pound out exceptionally deep, tuneful bass that belies its size and plays louder than most will ever require. Simply Faster: Experience A Better Engine The new composite alloy/fibre engine in T/7i blends precisely the correct dimension of stiffening alloy with a fibre material chosen for its sonic neutrality and light weight. The combination is brilliant; exceeding the performance of competitors' drivers that are many times more expensive. The forward-firing 8" active couples with a larger 10" down-firing passive, again with carefully chosen balances of alloy to fibre and the result is seamless, effortlessly deep bass that blends perfectly with the main speakers. Brains and Brawn: The Power Behind REL If our driver designers deliver the structure of REL's sound, the electronics are the brains and the power behind our success. Serie T/i uses the same Class A/B power amplifier sections with large, high current power supplies, precision-wound toroidal transformers and an amazing reliability record that has powered almost 100,000 RELs. Our proprietary filter designs are responsible for rave reviews for REL's unique ability to blend seamlessly while layering on all the harmonic structure missing from conventional systems. Comes with connecting cable to run to amplifier. Can also be used wirelessly with addition of the REL Acoustics Arrow Wireless Transmitter Receiver. Available Mid-October 2015. Experience home theater and music as the artist intended with the most award winning high-end subwoofer brand, REL Acoustics. The T7i enriches modest systems with deliciously sumptuous natural bass, high quality construction, and gorgeous finishes. Features high quality long throw drivers and powerful, reliable amplifiers. Makes music and cinema sound more natural with enhanced spatial resolution. 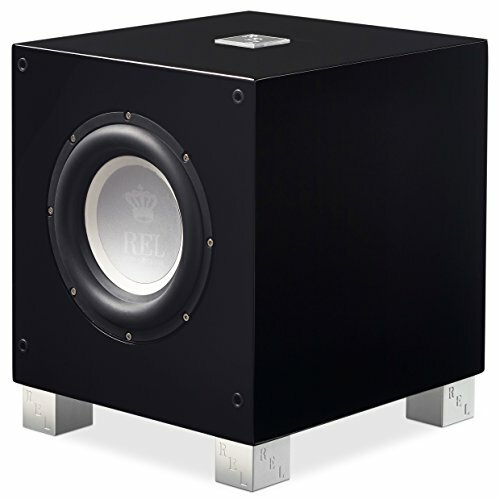 Increases the soundstage depth and imaging for a truly high end experience. Arrow Wireless compatible, Front-firing 8" long-throw steel chassis driver, 10" Down-firing Passive driver, 200 watt Class A/B amplifier with High Level Neutrik Speakon, Low Level single RCA, and .1/LFE RCA inputs, -6dB @ 30Hz in room frequency response. WARRANTY: 3 years parts and labor on new products. Covers all REL products and parts that are defective in material and workmanship. We will, at our sole option, repair or replace any defective parts free of charge. The warranty is no transferable. If you have any questions about this product by REL Acoustics, contact us by completing and submitting the form below. If you are looking for a specif part number, please include it with your message.